With this pick up I decided to get an early start for this thread! 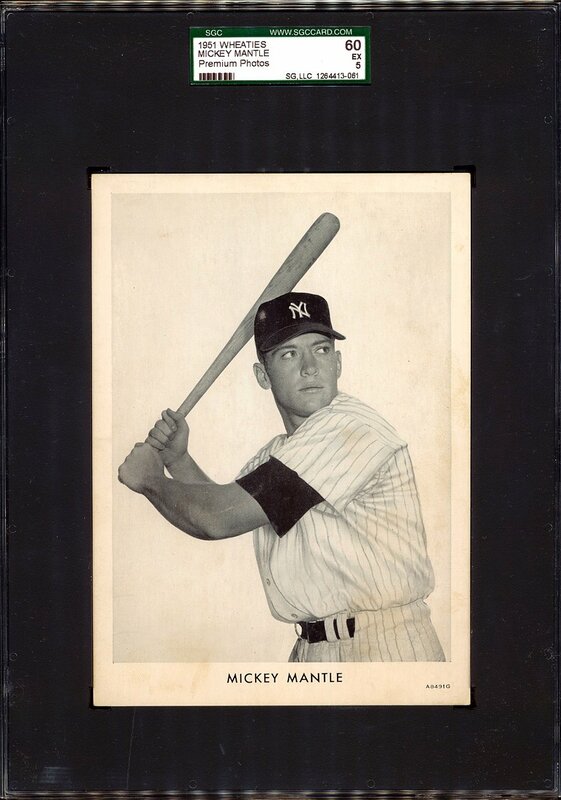 Building a high grade (PSA 8+) 1951 bowman set. Looking for a 1951 bowman baseball wax pack, 1 or 5 cent! Thanks mr. Daniels. Solid cards! !......OOOPS SORRY ABOUT THE DUKE..
Last edited by mightyq; 10-01-2009 at 04:19 PM. Finally! Wanted this one for a while. Send a private message to Anthony S.
Find all posts by Anthony S.
Send that one back to GAI to have it re-encapsulated. Their new cases and labels look great and they secure the card better. Marty, great cards. Tough to pick which one I like the most. That Cubs Fatima up there isn't bad either. 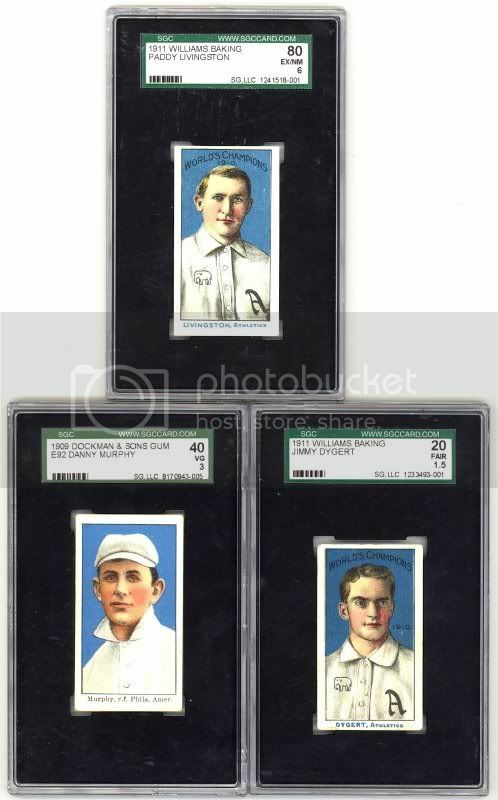 Collecting the T206 set and Cubs type cards. I did a little research and found one other that surfaced in 07 and sold in REA. That one was in much rougher condition than this one. All 4 border sides had been trimmed down to the photo size and it had a large 1" hole through it. I went ahead and simply copied REA's description for that one and attached below. This thing is awesome. 16"x20" in size. "Similar in style to the famed 1903 American League composite display photograph by Carl Horner, this extraordinary photographic composite, produced by the Weasner Photography Studio of Buffalo, N.Y., pictures the managers and players from the eight teams comprising the 1905 Eastern League: Baltimore, Rochester Buffalo, Newark, Jersey City, Toronto, Montreal and Providence. Among the managers pictured in the center of the display are Hughie Jennings for Baltimore, George Stallings (who later managed the 1914 “Miracle Braves”) for Buffalo, and Jack Dunn (who later signed Babe Ruth to his first professional contract) for eventual league champion Providence. 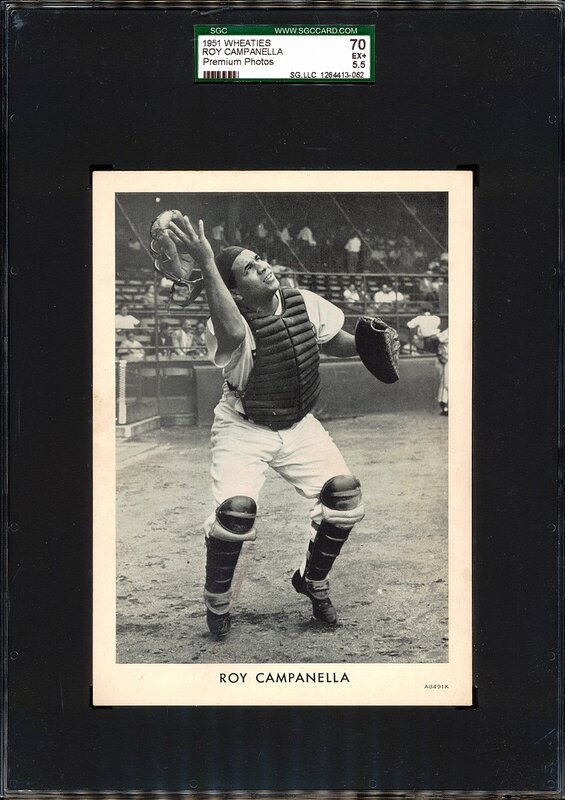 A total of 120 different player images are displayed, including many players who had been in the Major Leagues in prior years and were just winding down their careers, and many others who went on to the Major Leagues in future years. 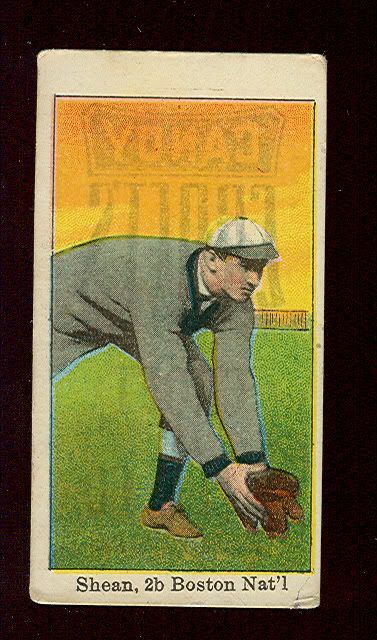 Many players in this composite appeared in the T206 tobacco card set. The Eastern League began play in 1892 and remained in existence under that name until 1912, whereupon it became known as the International League. During an era of few Major League teams, the minor league circuits represented the top level of organized baseball for many areas of the country. 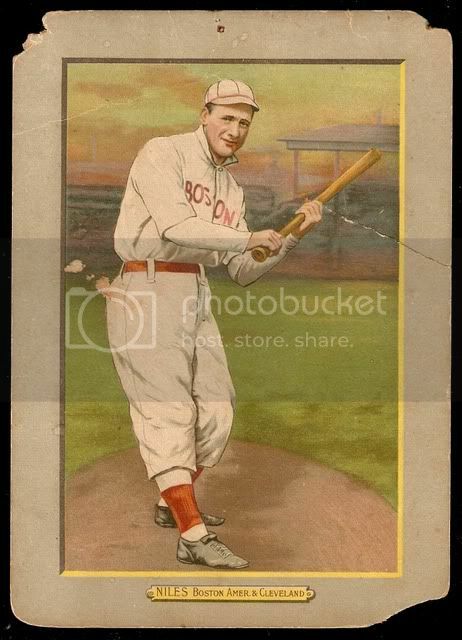 The Eastern League was one of the most prestigious minor league organizations on the East Coast and was at one time presided over by Ed Barrow. This is an extremely substantial and impressive display piece, produced at great cost no doubt, and one that truly reflects the lofty status of the Eastern League at the time. 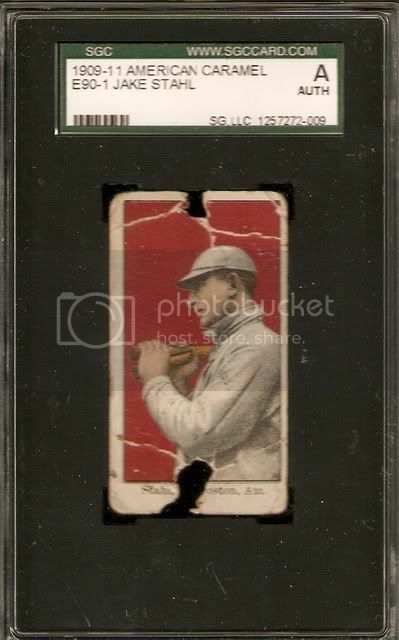 This is the only example of this rare composite we have ever seen." Last edited by 3-2-count; 10-05-2009 at 11:14 PM. Last edited by mightyq; 10-04-2009 at 07:45 PM. Marty - Those are some fantastic cards, congrats! 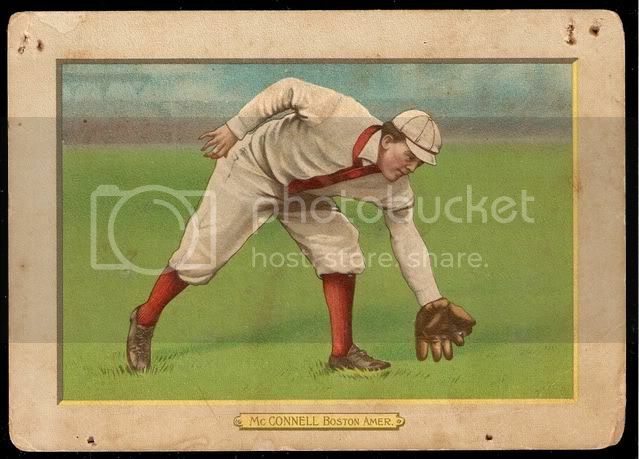 to bring up to date my "Winning pitcher of record of a game on the Winning Team of the World Series since 1900" set. 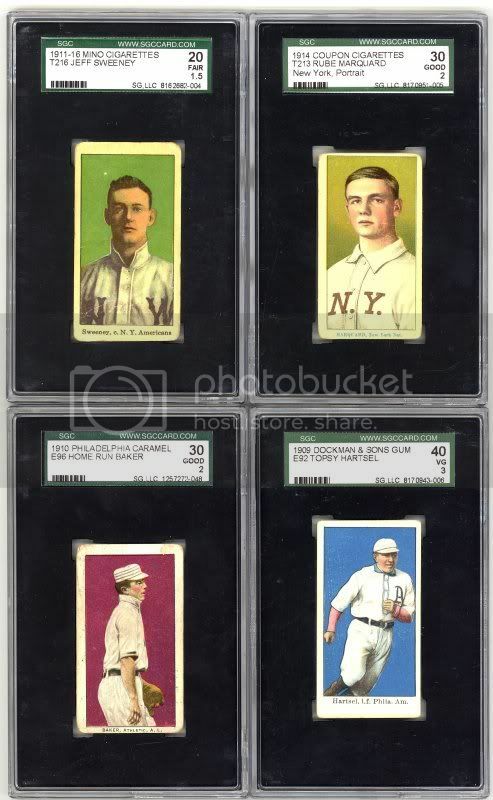 a few more CJ's, pretty excited about the Cravath! Last edited by chiprop; 10-06-2009 at 03:35 PM. Many thanks to a fellow board member for trading this one to me. Damn...that d359 Williams Livingston is "off the hook!" D303 General Baking Bender - striped....Balt..
Been a slow year. But quite pleased with this one from Mile High last night. One of my Springfield Ponies players. Last edited by pete zouras; 10-07-2009 at 01:18 PM. Nice pickup Steve - I forgot all about the auction ending last night - I certainly don't need 5 emails letting me know an auction is ending, but one would be nice. To send me a Private Message, click here. Please check out my albums. Erick - I'm a sucker for CJ's. Great cards! Finally found a Beckley. Been looking for a couple years now. Steve- nice pickup on the Zeenut Barbour. I was underbidder and thought it had great eye appeal. 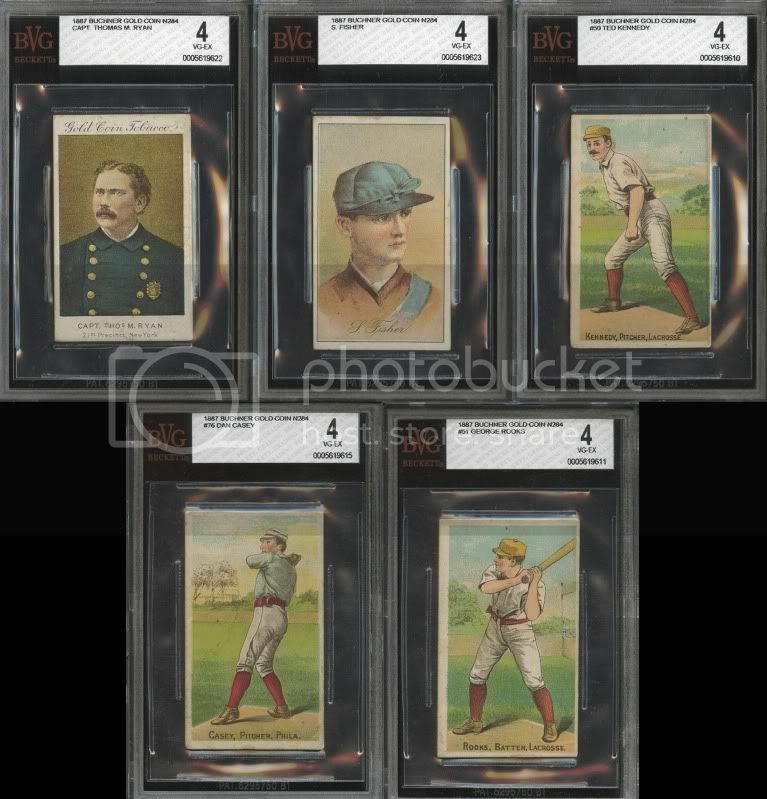 I thought the 1915s with Coupons, slabbed as 5s and 6s were a very, very good bargain. Nice Turkey Reds Scott. Look forward to checking out your incoming. 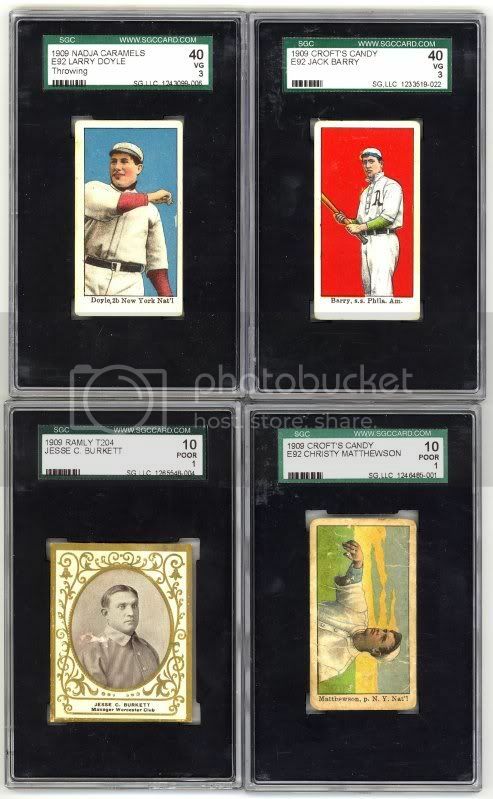 What an amazing array of cards in this pick-up thread! Super M116 Myers, a pack fresh Zeenut, bookoo CJs, Holy Sh!t, Dan K & Mighty Marty! My contributions to October Show'n'Tell are these yet-to-be-received cards from Heritage. Been wanting an E107 Chesbro since they came out in ought-three; the YumYum didn't get as much action as I anticipated so it kinda landed in my lap. wow - two great cards David, not sure which one I like more! I like the Clarkson better, but agreed. Two awesome additions. Congratulations. got these earlier this week! another one for the backs and somehow ended up with another carrigan???? One of my favorite poses of Cobb. 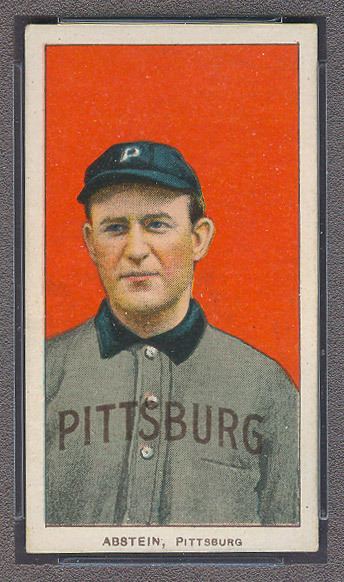 The postcard is postally used, but the good news is that part of the sender's content, dated Oct. 15, 1909, is a nice reference to the World Series between the Tigers and Pirates. I'll take that over a higher grade any day of the week. Find all posts by Rob D.
These don't hold a candle to any of the amazing cards previously posted - great stuff! 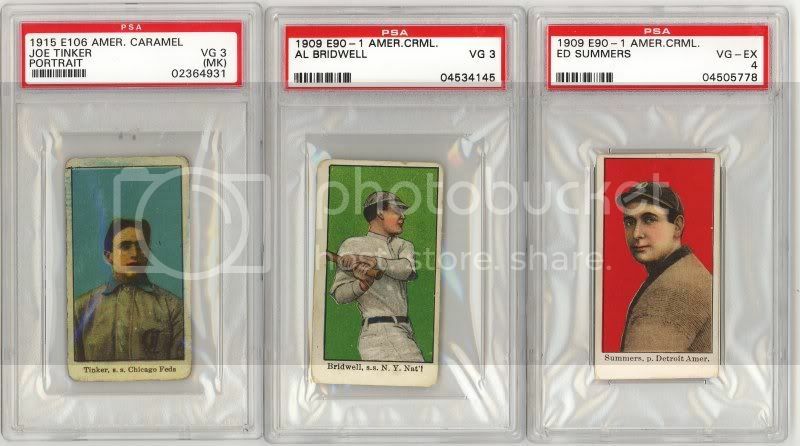 Just a couple of Pirates from various sources..
Trade in response to B/S/T - thanks, Rob! Wow. Amazing accomplishment! Do you have all of the Cicotte's? Appreciate the kind words, Michael!